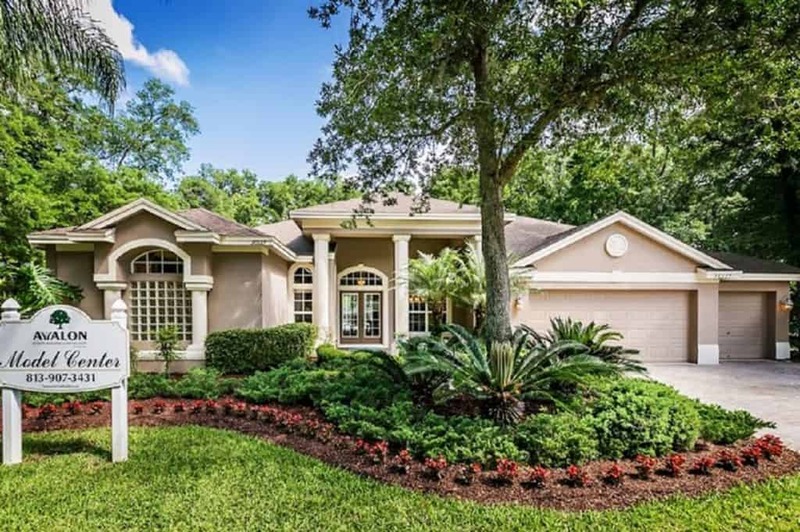 The Avalon series of models has won the very prestigious, top Grand Award in The Tampa Bay Builders Association Parade of Homes and the Best of Show Award in The Pasco Builders Association Parade of Homes numerous times in each association. The Avalon Series has also won Best Kitchen, Best Master Suite, and Best Floor Plan in its category, also numerous times. The Avalon model is very livable and fun for family life. It is spacious, bright and open with a great floor plan and architectural details. And there is no wasted space. 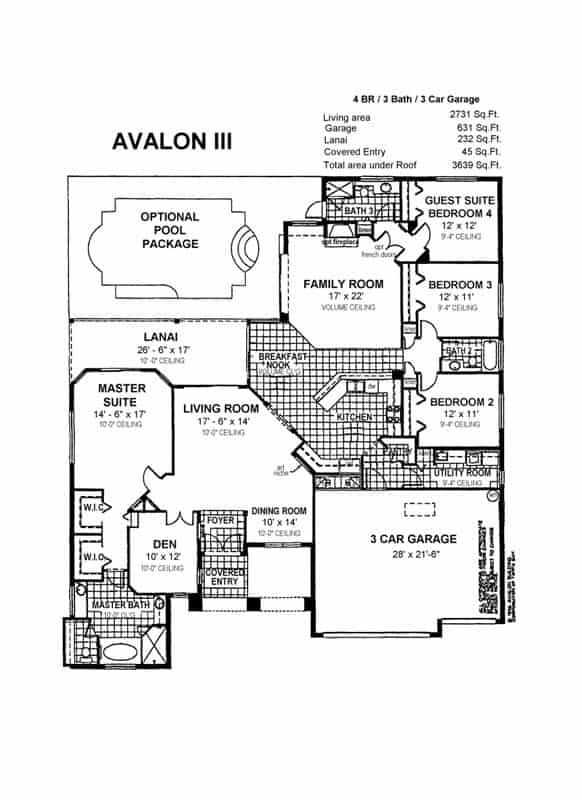 You may want to print the Avalon IV floor plan to have as you read through this description. The Avalon IV at 3170 SF is the model shown in the photo gallery. It is a 4 BR/ 3 BA/ Den/ Bonus Room/ 3 Car Garage home. The Family room and kitchen, as key living areas, are oversized. The Family room is 17 FT wide with a 13 Ft vaulted ceiling and pot shelves for a warm and very spacious feeling. The Kitchen has a 10 FT flat ceiling for height and a feeling of separation from the family room. Its layout is very functional, with plenty of counter top space, storage, and a walk-in pantry – all overlooking the family room and outdoor area. The Bonus room is huge (just as big as the family room) and is uniquely located behind the family room. It also has a 12′ 4″ coffered ceiling, a full length pot shelf, a 9 FT triple slider and 8 FT picture window overlooking the outdoors and pool area. The Master Suite is spacious, and both the Master and Living room come standard with coffered ceilings in the Avalon IV. The kid’s rooms are all 12 x 12 and the 4th Bedroom is oversized with a private entry to the bath so it can also serve as a guest or in-law suite. The utility room is big and bright with counter top space and a storage closet. Avalon Building Corporation reserves the right to modify features, specifications and/or prices without notice or obligation. No guarantee is made that the materials, features and amenities depicted by artists’ renderings or otherwise described, will be built, or if built, will be of the same type, size or nature as depicted or described and all are subject to change without notice. All floor plans and elevations are copyrighted. We enforce all federal copyrights. Floor plans, features and room dimensions vary per elevation. All square footages are approximate.